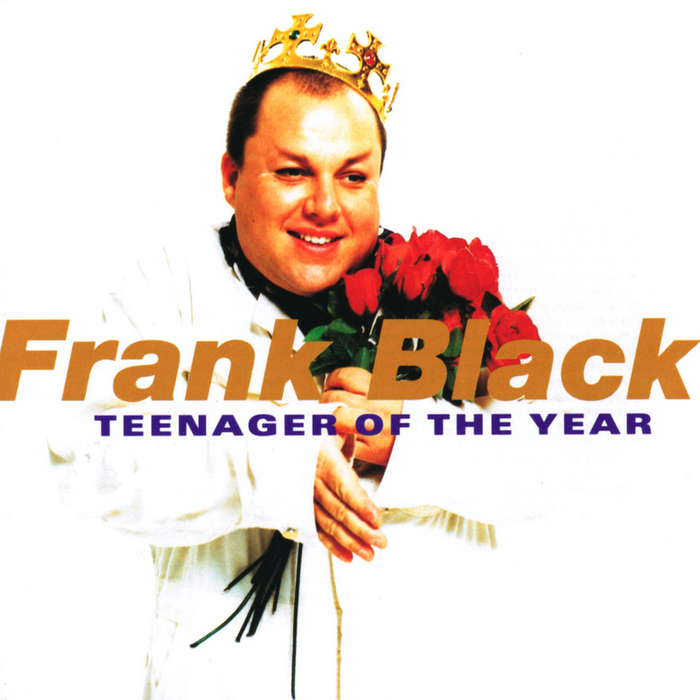 Frank Black’s second solo album, Teenager of the Year, is the first one I ever owned. I actually bought it from a guy in the student union building in my senior year of college. I had it for a while before listening to it, and when I did I thought it was interesting but not spectacular. Later, it grew on me, to the point that I’d say it’s probably one of my favorite albums by anybody. There are a whopping twenty-two songs on it, although some of them are quite short. Science fiction themes are common on this one as well. Whatever Happened to Pong? – Basically just a nostalgic song for the early era of video games, when Pong reigned supreme and Frank and his brother would play it for money. Calistan – Is it just me, or does Frank sound a lot like Mark Knopfler on this one? It sounds somewhat reminiscent of “Sultans of Swing,” especially. It’s basically about California in sort of a dystopian future, looking back at the history of the place. I’m not sure why he pronounces “Navajo” with an English J sound, but I can’t say I know how the Navajo themselves pronounced it prior to the arrival of the Spanish. Frank also plays on this by saying John Wayne’s name as “Juan Wayne.” The line “St. Anne is still making it breezy” refers to the seasonal Santa Ana winds. The Vanishing Spies – This one is about the Mars Observer, a probe with which NASA totally lost contact in August 1993. Frank reports almost having seen it. Headache – The main single from the album, and I’d say it’s deserving of that honor. It’s a little repetitive, but still quite enjoyable. I appreciate how Frank’s voice gets low and breathy during the “Well, I found you” part. The opening line makes me think of Madeleine L’Engle’s A Wrinkle in Time, although I think Frank might have actually taken it from something else that used the same phrase. The video reminds me of the one for They Might Be Giants’ “Ana Ng,” what with its being in black and white, showing the singer at a desk, and doing a close-up on a map at one point. I guess that’s not too weird as they have the same director, Adam Bernstein, who was also responsible for Sir Mix-a-Lot’s “Baby Got Back” video. Sir Rockaby – A sort of cosmic lullaby, with Frank showing off his falsetto. He said before that he wanted Ray Davies to write the lyrics for him, but even though he sent Ray the music, nothing came of it. Freedom Rock – At its most basic, it’s a song about thinking for yourself and not wanting to listen to music just because it’s popular. I seem to recall reading somewhere that the bit about “the pleasure of tones that belongs to the guy with no ear” is about a deaf person, but I can’t really see how that makes sense. Oh, well. Two Reelers – Frank’s tribute to and defense of the Three Stooges, using the real names of Curly, Shemp, and Larry. Among the trivia mentioned are that Curly shaved his head to play the role, and that Larry could play the violin. Their theatrical shorts were two-reelers, and Jules White directed most of them. This is also another song with a sharp distinction between the chaotic verses and the more melodic chorus. Fiddle Riddle – I’m not entirely sure what this song is about, which I guess is why it’s a riddle. I think it’s been stated that it’s at least partially from the point of view of the planet (sort of like “Thalassocracy,” then), and how machines could continue functioning long after humanity has died out. Not sure what that has to do with fiddles, and it’s not like there’s any violin on the song. It actually has kind of a reggae beat, and there’s a bit of “Chopsticks” in the solo. Ole Mulholland – William Mulholland was responsible for the building of the Los Angeles Aqueduct, which brought water to the city from the Owens Valley. The opening words “There it is! Take it!” were said by Mulholland himself during the opening ceremony, and the rant during the bridge is also a quote from the engineer. Job Harriman was a socialist candidate for mayor who criticized the aqueduct, and Mulholland’s response was rather sarcastic. I don’t know whether he pronounced “Los Angeles” with a hard G or that’s a callback on Frank’s part. The song also mentions author Ray Bradbury, who was responsible for some of the concepts that went into the design of shopping malls. Mulholland, Harriman, and Bradbury would all feature in later songs of Frank’s as well. Fazer Eyes – Honestly, these next few songs kind of blend together for me. That’s not to say they’re bad, just that I sometimes try to remember the words to one and start thinking of another instead. This might be another song about a UFO sighting, but I’m not as sure about this as I am some of the others. I Could Stay Here Forever – Another love song with cosmic ramifications, this time including a reference to the speed of light and a comparison of the narrator’s relationship to that of salt-licking behemoths. I’m not sure if this refers to an actual kind of animal or not. Since a monster was used to represent the Los Angeles metropolitan area a few songs ago, I don’t even know whether it’s literal. The Hostess with the Mostest – This one is much more of a fast rock number than the last two, but I still tend not to remember it quite as well. Frank has pretty much confirmed that it’s about the Del Amo Mall in Torrance, California, which was the world’s largest shopping mall until 1992. It mentions Laurasia, the prehistoric supercontinent of which North America used to be part. Superabound – One of my favorites, partially for the way the quiet beginning merges into the rest of the song, but also because of all the references, some of which I still can’t figure out. The first verse discusses P.T. Barnum and his “see the egress” signs, a trick of his based on the fact that rubes didn’t always know “egress” meant “exit.” I don’t think anybody knows what an ishist is, and even Frank himself has forgotten, or perhaps just doesn’t want to tell anybody. This definition of “ishism” at Urban Dictionary makes sense, but of course anyone can edit that page, and this might have been a case of someone wanting to fool Frank’s fans. In fact, pretty much all of the Google results that make any sense to me at all are from after the song was released. It also makes for one of the song’s weird rhyme patterns, with the second verse rhyming it with “wish list” and “dish kissed; then “potlatch,” “sasquatch,” and “mismatch” in the final verse. I’ve seen it suggested that the song itself is about the boredom that would come from immortality, and this forum post suggests that the line “A space is made by telephone” could be a reference to the long gap on Nixon’s tapes. Big Red – A song about the terraforming of Mars, with kind of a fun surf sound to it and a lot of breathy singing from Frank. He’s said it was inspired by Kim Stanley Robinson’s Mars trilogy, which I haven’t read. I assume the “mule they call Sal” is a reference to the Erie Canal song that we used to sing in elementary school. And Mars having canals is based on a famous mistranslation; what it actually has are channels. White Noise Maker – This one seems rather more straightforward, being yet another escape song, but this time not about physical travel. It’s about wanting to drain out the obnoxious noise of the world with a white noise machine. Pure Denizen of the Citizens Band – As far as I can tell, it’s about someone who doesn’t drive a truck arguing for his right to use CB radio. I particularly appreciate the spoken bit at the end that sounds like it’s actually coming over a radio. Bad, Wicked World – This fast-paced number with a cool guitar solo in the middle is about the television show The Invaders from the late 1960s, about an architect named David Vincent who’s discovered alien invaders who can be distinguished by their non-bending pinky fingers. I’ve never seen the show, but Vincent is definitely a character who belongs in one of Frank’s songs, a seeming eccentric who never gives up despite society’s disbelief. This entry was posted in Albums, Frank Black, Music and tagged acrostics, adam bernstein, dire straits, ishist, jean marie walsh, job harriman, mark knopfler, mars, mars observer, p t barnum, ray bradbury, ray davies, teenager of the year, the invaders, the three stooges, william mulholland. Bookmark the permalink. I just arrived here by accident, googling, and ended up reading the whole post, and commenting. Funny. Anyway, I agree with you: this album is amazing. Interesting analysis, many things that I ignored, but I just wanted to say that Fazer Eyes is great, the last minute solo guitar is just wonderful. “Fazer Eyes” isn’t one of my favorites, but I always appreciate it when someone gives me a reason to appreciate something I didn’t really think about that much before.